The Expo today was i.n.s.a.n.e.!!! Waaaay too many people converging on the place to pick up their race bibs, then their gear bags with finisher shirts…only to descend upon the Land of Disney Race merchandise! Erin and I were able to each score a race T-shirt. She for the 10K, and I for the Dumbo Double Dare. It wasn’t easy, and we had to give some folks our best Jersey stare when they tried to steal our shirts right outta our hands For real people? For real? Are we gonna do this? Peter manned the check out line. He stood in a line that snaked in-n-out of the ball room no less than 6 times. A line worse than any E-ticket attraction at any Disney Park anywhere! Over 2 hours. No lie. To buy two shirts, and a limited edition pin. That’s love I tell ya! We love you right back Peter! But by far, the B.E.S.T. time spent was by Caitlin. She found her way to the quietest part of the venue — the tables where they offered poster board, and markers, for the purposes of making “Cheer Signs” for your loved ones. 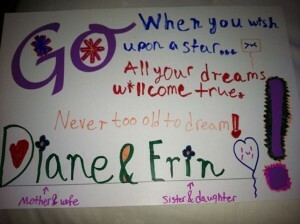 Caity made this sign for Erin and I. Our hearts began to sing when we found her there, …..creating away….. pouring her love for us onto cardboard. Tomorrow when Erin and I see her with that sign on the side of the road, our hearts will soar…and I believe we will be carried to the finish line by her love.